Why Prep for the GMAT? 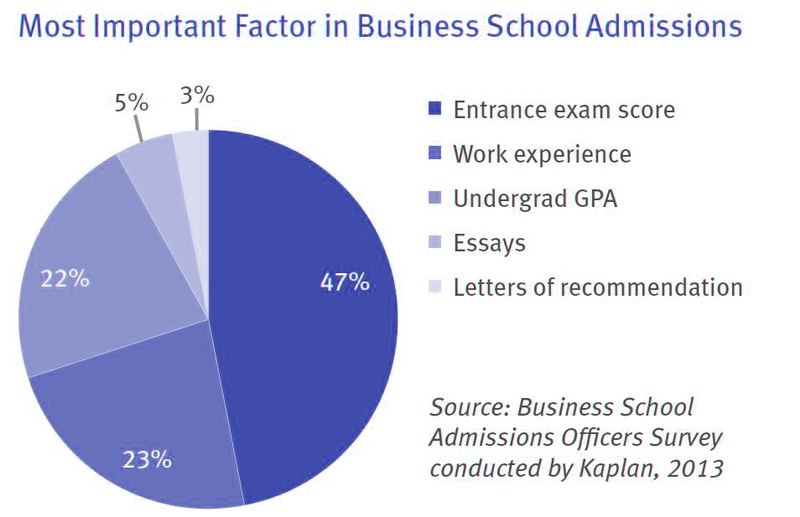 Because there are many components in MBA and Graduate school applications – forms, essays and personal statements, undergrad transcripts, letters of recommendation and more – and because many of these are subjective, it is difficult to compare applicants from just those things alone. GMAT scores provide a common benchmark for every applicant, and allow admissions committees to compare the credentials of candidates from widely varying backgrounds and with different levels and area of experience. You can increase your chances of admittance to the MBA or Masters program of your choice with a high GMAT score. More than 250,000 people take the GMAT each year — so ensure you prepare thoroughly to beat the competition! Taking an important test like the GMAT will never be stress-free, but it can be far less stressful with the correct approach and proper preparation. The Kaplan GMAT prep course will break everything about the GMAT down to exactly what you need to know to test confidently and score higher. If you’re looking to succeed on the GMAT, you’re in the right place. How much should you study? Students who score 700 or higher study for an average of 102 hours. 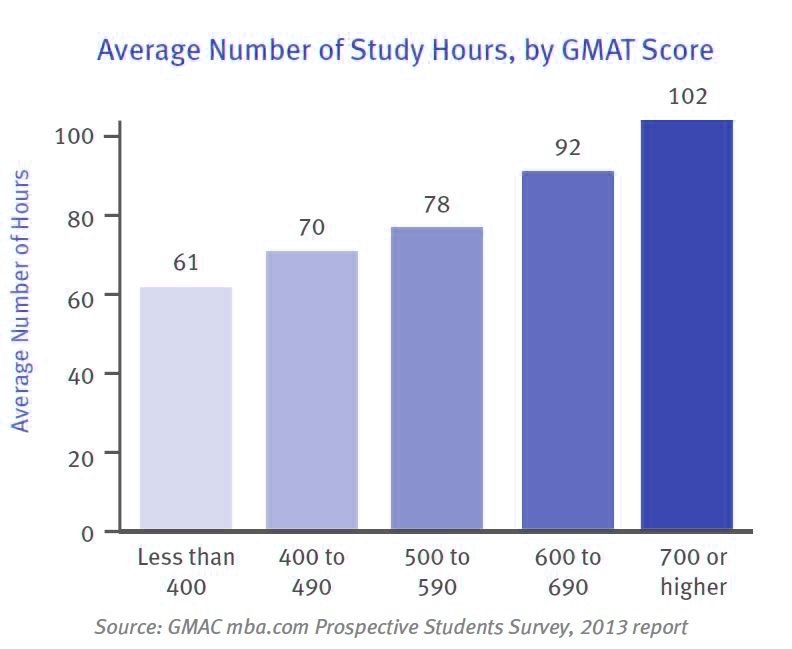 Data collected by GMAC, the maker of the GMAT, show a clear positive correlation between the number of hours test takers study and their GMAT score. But the secret to a higher score isn’t just quantity of practice— quality of practice counts for at least as much. That’s where Kaplan’s adaptive learning technology and expert faculty can help. We leverage our decades of experience with analyzing the GMAT and understanding student performance so that you can use your limited study time most efficiently. GMAT scores are valid for 5 years and are used as a common benchmark to compare candidates for admission, Although the median score is approximately 560, the average GMAT score for the top 10 business schools, according to the U.S. News and World Report, is 720, which is the 94th percentile. so Test takers receive four scores on the GMAT. Each of these scores will be accompanied by a percentile rank. The percentile rank indicates the volume of test takers who scored lower than you on the test. The higher the percentile rank, the better you did. For example, a percentile rank of 70 means you did better than 70% of test takers. This number shows exactly where you fell compared to other GMAT candidates. Each essay in the Analytical Writing Assessment is given a separate grade on a 0-6 scale by two different graders - a human and a computer called the "e-rater". These grades are assigned holistically using all aspects of the essay's content, style, and grammar. If the two grades agree, that score will be assigned. If the two scores are markedly different, then a third scorer (human) will read the essay to determine its final grade. How long must I wait to get my GMAT score? You can view your "unofficial" GMAT scores at the end of the exam prior to making a decision to accept or cancel, giving you more certainty and control of how your application and GMAT scores are received by schools. You will then get your “official” score 21 days later. If you accept your scores: The official report will be sent to the schools selected. If you cancel your scores: You can cancel your score right after you take the exam at the test center (for free), or within 72 hours of taking the exam ($25 fee). No cancelled scores will be sent to selected schools. Only you will know if you cancel your scores. To reinstate your canceled scores: You can reinstate your score online if your exam date is on or after January 1, 2014, up to four years and 11 months after the exam date($50 fee. After it is reinstated it will be sent to your selected schools at no additional charge.